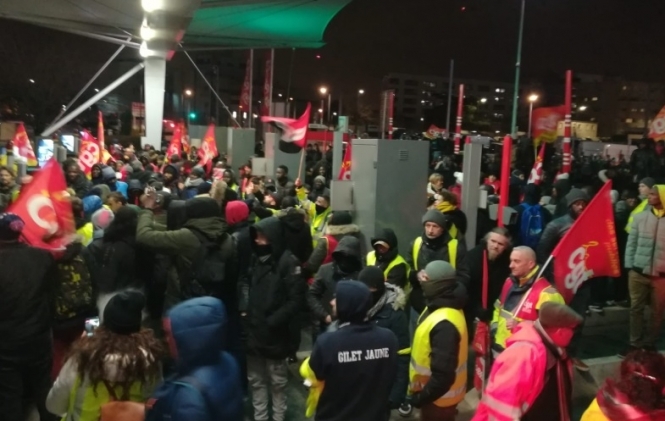 Up to 300,000 people across France joined the CGT union general strike protest yesterday, according to union figures, marking the first significant collaboration between unions and gilets jaunes protesters. The CGT-led strike march on Tuesday February 5 shut down some transport links, school canteens and tourist attractions yesterday, as thousands called for a fairer tax system and lamented what they see as a continued loss of buying power. Other grievances included opposition to lycée reform, and rising fees for foreign students. The largest march was seen in Paris, but many others also took place in towns and cities across the country. CGT general secretary Philippe Martinez said the day had been “a success that will lead to other [successes]”. Yet, while union bosses claim almost 300,000 people came out across 200 towns and cities, figures from the minister of the Interior counted just 137,200. In Paris, the CGT counted 30,000 people compared to the 18,000 figure released by police. While CGT marchers dominated the crowds, many protesters wore the yellow vests of the gilets jaunes movement, marking the first significant collaboration between the two groups. Previously, the gilets jaunes have distanced themselves from official union groups. In Marseille, police estimated 5,200 people came out, with a similar mix of CGT and gilets jaunes. In Lyon, around 4,300 protesters were counted, of which 500 gilets jaunes. In Toulouse, police estimates counted 8,500 people; 2,500 in Caen; 2,300 each in Lille and Clermont-Ferrand; 2,200 in the Havre; 1,500 in Strasbourg; 1,400 in Nimes; 1,300 in Tours; and 500 in Rennes. Most protests were peaceful, except for some dustbin fires during a march in Bordeaux. Although this marks the first significant collaboration between unions and gilets jaunes, it is still not clear how many people actually came out in support, as estimates of numbers between protest organisers and the police often vary significantly. This is due to different methods of counting crowds. Methods can include using bus and train ticket sale figures to the protest sites to help give a rough guide, and can also involve people standing at different parts of the march, estimating how many protesters there are per row or line. Police often also use videos of the protest to help estimate numbers, and usually allow more space per person in their calculations, compared to methods used by march organisers.